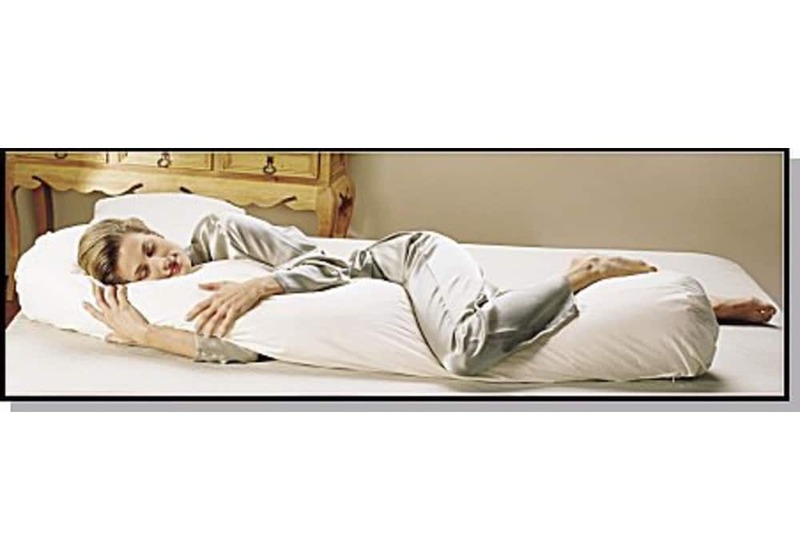 This is the ideal therapeutic positioning body pillow for everyone (also a great pregnancy pillow). Having this large pillow for bed time makes sleeping easier. The extra long cylindrical shape was designed to conform naturally to the human body to allow sleeping in the healthiest possible position - the semi-fetal curl. Soft and huggable, the cylindrical pillow is made from pure cotton and stuffed with premium, hypo-allergenic poly-fiber that molds to support your body. As you sleep, it effortlessly aligns your spine, reduces pain and muscle stress, and encourages healthy sleep positions. Recommended by Parenting Magazine - Jan 1997, the Sleeping Bean is a life saver for pregnant women trying to find a comfortable sleep position and can even help in the delivery room for labor positioning. And after delivery, the Sleeping Bean is a great aid to a nursing mother as she holds and feeds her baby. These special positioning body pillows are particularly useful for home health care, long term care, and for people with disabilities, and have helped thousands of patients find therapeutic comfort during difficult times. For example, it may help to reduce bedsores by distributing patient's weight bearing areas and improving blood circulation.